Just like we care about maintaining our balanced diet, we want to ensure our pups are eating the food they need to live long, healthy lives. To do this, it’s important to understand what makes a great dog food. Our Freshpet veterinarian, Dr. Katy Nelson, shares her tips for choosing the best food for your dog. The first thing you should do when choosing a food for your dog is talk to your veterinarian. 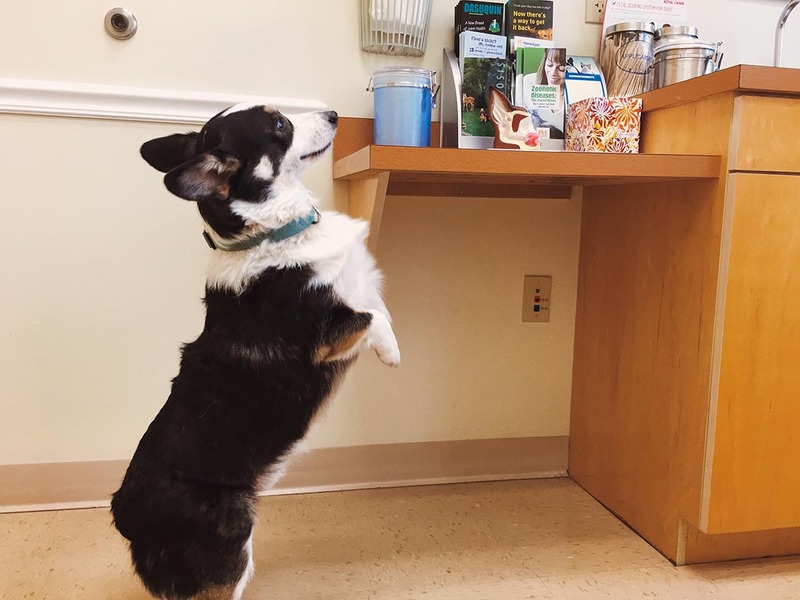 Your vet will be knowledgeable about your pup’s target caloric intake and how it is affected by factors such as body condition, lifestyle, life stage, or medical issues that should be taken into consideration. This discussion with your vet will give you a full picture of your dog’s health and help you find the right food for their needs. When looking at dog food packaging, check to make sure that phrase “complete and balanced” is present. This means that the food provides all of the necessary nutrients in the right amounts for the dog’s stage of life. This is also why it’s important to choose life-stage specific food – puppies, dogs, and seniors all have different nutritional requirements. The use of chemical preservatives in food, even those labeled as “natural”, has a long and controversial history in the pet food industry. There have been numerous claims that high levels of preservatives may lead to a health issues in dogs, ranging from behavior issues and skin disorders to even cancer. The best way to avoid these potential side effects is to choose a fresh food that uses the refrigerator as a “preservative”. 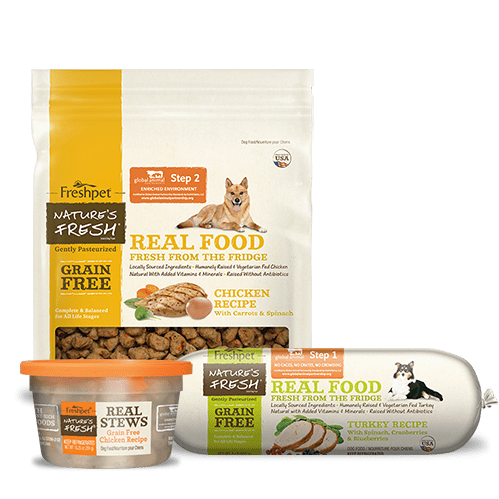 At Freshpet, we believe dog food should be made with real animal protein instead of product meal. High-protein, meat-based foods are rich in amino acids and other nutrients that help your dog build lean muscle, burn fat, and promote healthy organ function. Dog foods made without these real, high-quality proteins need additional supplements in order to fill the gaps they leave in nutrition. Fortunately, all of our Freshpet recipes hit all of these points. 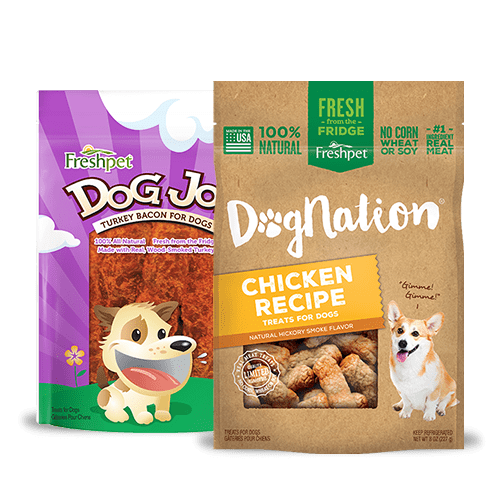 Free from preservatives, complete and balanced recipe, and made only of the freshest ingredients are just some of the standards that we incorporate into our recipes to help your pup live a long and healthy life. My "pup" enjoys Fresh Pet and is healthy at 9 years old. Literally the only dog food my beagle will eat. Thanks so much!!! Our 13 year old Lab recently stopped eating her kibble and would only eat the canned dog food we mixed in. 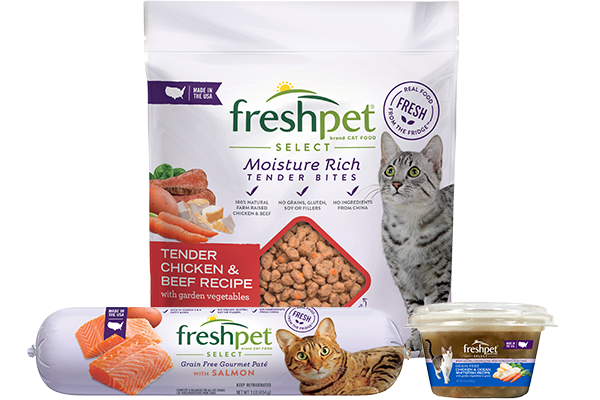 As we were concerned about a lack of nutritional needs I did some research and decided to try Freshpet Select roasted meals. 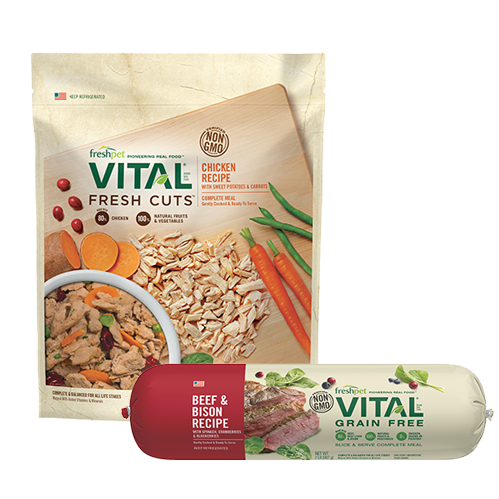 Although they are pricier than other dog foods, our Lab loves them and they are tender so there is no issue with her aging, worn down canines and we KNOW she is getting the nutrition she needs. 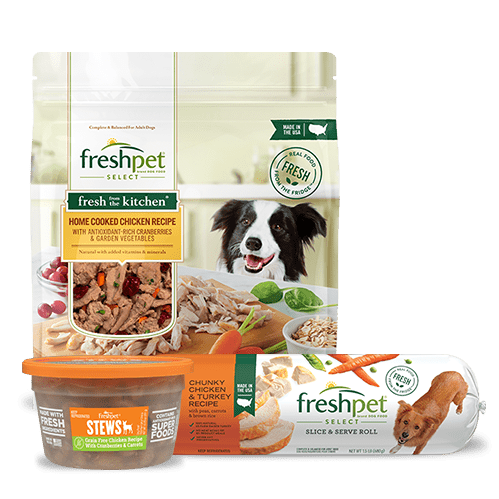 Thank you Freshpet for providing a healthy alternative that our dog loves. Good info, all 4 of my Yorkies are eating the 6lb. Beef chugs. Really good weight control, and I like the no additive aspect. I have been using fresh pet for years on my 4 husky mixed dogs after one had severe allergies. I am so impressed at how soon he was off medication by feeding him right. I sent your company an email 3-4 years ago about my 17 year old pup that was declining. I started her on Freshpet. She started getting more energy and she was back to her almost old self. Unfortunately, she died just before her 21st birthday, but I know her regime of Freshpet kept her to live that long. I am now getting ready to adopt a pup from Puerto Rico that was abandoned. She will also be only on Freshpet. Yes, I have found this to be true of animal meal. Our little guy came from an abusive family. When we got him he had some stomach issues and was hard to digest food well. The Freshpet products seemed to digest good for him. It has been 4 years and he is going strong. Proteins, quality and freshness and no added preservatives have played a big roll in his life. And of course love has helped. I spent the first year of my ChiPoms life throwing out 1/2 cans of food, 1/2 bags of food because she would pick out the part she liked and leave the rest. Not only was this expensive, it was also non nutritious because she was only getting part of the diet. Finally I stumbled upon Freshpet and that was the Answer. She will only eat the Chicken or Chicken and Turkey, but I see no need to force Beef upon her when they are 100% Nutritious. I buy 2 rolls at a time and switch every day. Thank You for making the Perfect Food for My SAGE. My dogs love freshpet dog food. I have two pugs. One very senior 16+ and a getting there 8 years old. I also have a fiesty 7 year old Ihasa. My vet says they are all in good health. My 15.5-year-old poodle has been a new dog since switching her to Freshpet. She is more alert, more energetic, and absolutely loves the food. My 8 lb Poodle LOVES Freshpet. I mix it with some dry food to make sure she is getting some crunchy food for her teeth. She gets 1 cup per day of the mixture but cries for more. Dog owners planning on feeding their dog Freshpet on a trial basis be warned. They will never eat anything else! They will only eat Freshpet from that point on. They know better. P.S. they will be much happier. My Shihpoo is 15 months old and Freshpet has been his diet all along! His predecessor Buster lived 16 years and ate Freshpet for the last 7 years of his sweet life. I feel very strongly that it’s the best food to feed my dog - I like that I KNOW what is in it and that means everything to me!! My Chihuahua’s are 16 and 10 years old my 16 year old baby has been eating Freshpet for the last 9 years LaRue is a very picky eater he loves Freshpet Bella my 10 year Chihuahua when I found her she had very bad dermatitis and was malnourished under weight now she is simply beautiful LaRue and Bella have beautiful coats of hair. Thank you for a wonderful product. boxer dog 10 years old stoped eating i tried all kinds of dog food but she refused to eat. i tried fresh pet deli rolls and she is eatlng again this food is awsome. What coincidence i just bought a freshpet dogfood and my dog really loves it. Thanks for the info! That's great to hear, Ryan! Thank you for your support. 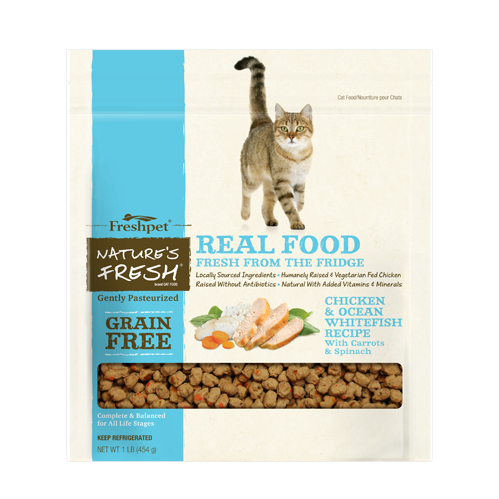 Freshpet is truly healthy, preservative-free and does give more protein to our pets. Very recommendable. I used to give my diabetic 10 yr old Yorkie kibble and raw dog food. He started walking away from his bowl at feeding time, something he never used to do. 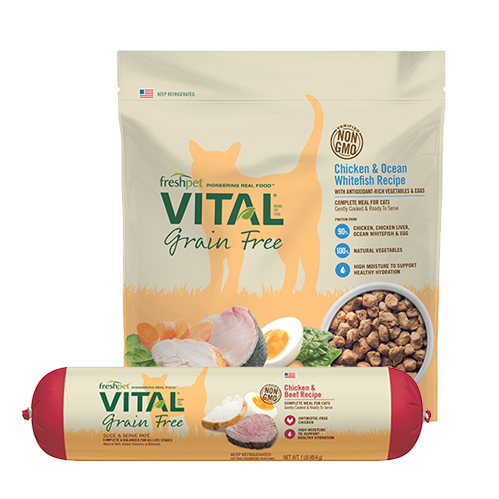 Because he is diabetic he needs to eat after his insulin shot, I tried grain free Freshpet, so far he loves it. I switched my very finicky 10 year old Shetland Sheepdog to Freshpet a month ago. After years of fighting to get him to eat. He loves it. Yeah i always look for a balanced food for my pup. I think it keeps them healthy.